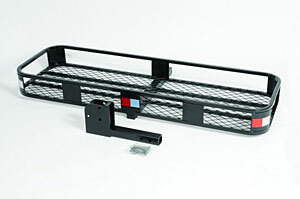 Cargo Holder Height (in) 8.000 in. Cargo Holder Length (in) 60.000 in. Cargo Holder Width (in) 20.00 in. Notes 500 lbs. maximum weight capacity. Fits 2 in. hitch receivers. DeeZee Cargo Carrier is designed to provide excellent storage space. It is made from a sturdy material offering extreme durability. This carrier is weatherproof and facilitates easy and quick installation.